Constant Comment: the Bigelow original secret recipe of black tea, orange rind and sweet spice. Earl Grey: carefully blended bergamot oil and handpicked black tea. English Teatime: hand-picked mountain grown tea for a full bodied, yet smooth cup. Lemon Lift: a distinctive blend of lemon, spice and black tea. Green Tea: hand-picked tea from high elevation gardens gently processed to bring out natural flavor. Green Tea with Pomegranate: green tea with just the right amount of sweet, fruity pomegranate. Subscribe to Office Ink Blog via email or RSS. Like On Time Supplies on Facebook and share the giveaway on your Facebook page. Follow OnTimeSupplies on Google+and share the giveaway. 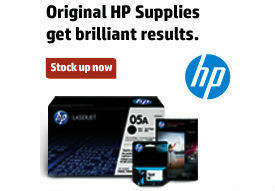 We make it easy to participate in OnTimeSupplies.com Giveaways with four different ways to enter. But if you do all four, you get four entries! Just make sure you leave a separate comment for each entry you do! 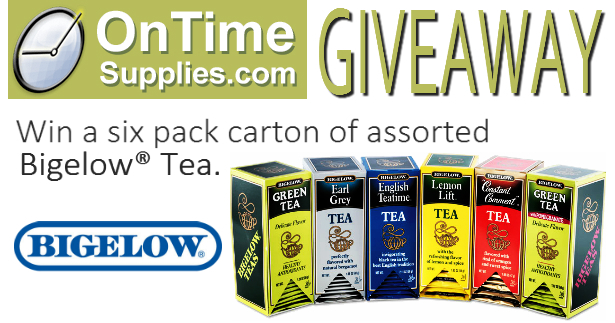 The Bigelow® Tea Giveaway ends Tuesday, June 10th. We’ll announce the winner Wednesday, June 11th. Green Tea is my favorite flavor! I like raspberry tea flavor. Lemon Lift sounds great! @MsEltonJohn on Twitter. Green tea with pomegranate. .oh I love! My favorite is Earl Grey. I enjoy the pomegranate green tea and English Tea Time. This momma needs her morning lift!